Fought in the wake of a decade of armed struggle against colonialism, the Mozambican civil war lasted from 1977 to 1992, claiming hundreds of thousands of lives while displacing millions more. As conflicts across the globe span decades and generations, Stephen C. Lubkemann suggests that we need a fresh perspective on war when it becomes the context for normal life rather than an exceptional event that disrupts it. 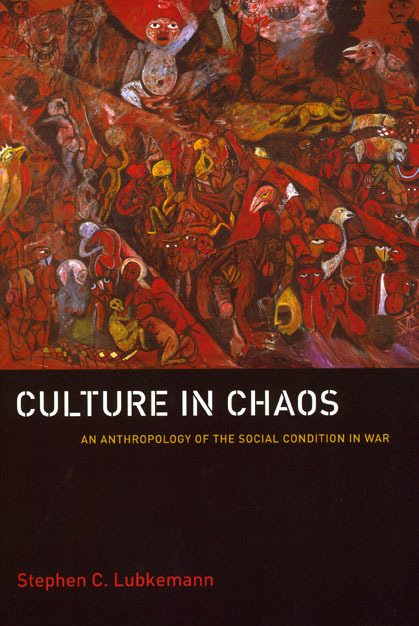 Culture in Chaos calls for a new point of departure in the ethnography of war that investigates how the inhabitants of war zones live under trying new conditions and how culture and social relations are transformed as a result. Lubkemann focuses on how Ndau social networks were fragmented by wartime displacement and the profound effect this had on gender relations. Demonstrating how wartime migration and post-conflict return were shaped by social struggles and interests that had little to do with the larger political reasons for the war, Lubkemann contests the assumption that wartime migration is always involuntary. His critical reexamination of displacement and his engagement with broader theories of agency and social change will be of interest to anthropologists, political scientists, historians, and demographers, and to anyone who works in a war zone or with refugees and migrants. "This is an innovative book on war, which has relevance well beyond Mozambique or even Africa. It advances a thesis that ought to change the ways in which scholars . . . approach the question of conflict--particualrly in non-western societies. It is certainly a must-read book for those who are interested in the consequences of war in southern Africa and for those who want to come to an understanding of conflict that eschews comfortable concepts and facile explanations." "An absorbing and thought-provoking book, this monograph is sure to be of interest to those concerned not only with the history of Mozambique and its post-colonial conflict and antecedents, but also to anyone intrested in the dynamics of conflict and migration in relation to questions of agency and social action." "This vivid ethnography is a compelling narrative of resilience and innovation, and how the experience of war fails to produce a cultural tabula rasa." "The book presents rich historical, demographic, and ethnographic data, and addresses important concerns in political anthropology, refugee studies, and other social sciences. These include the analysis of displaceent vis-à-vis migration, the critical rethinking of the state as a primary political form, and the theorization of social agency in war. The writing is accessible, the arguments clearly repesented, and the book speaks to a broad audience of scholars interested in agency, violence, migration, and social history." "A major contribution to the debate on the war in Mozambique, but also more generally on violent conflicts and migration flows in Africa and beyond." "In providing a detailed analysis of the .micro-politics’ of wartime social processes in Mozambique, this book also represents a new approach to the anthropology of war, which should be of interest to anyone working on violent conflict, displacement and migration."